Scientists at the National Oceanography Centre, Southampton are set to explore the world's deepest undersea volcanoes and find out what lives in a 'lost world' five kilometres beneath the Caribbean. The team of researchers led by Dr Jon Copley, from the University of Southampton’s School of Ocean and Earth Science, has been awarded £462,000 by the Natural Environment Research Council to explore the Cayman Trough, which lies between Jamaica and the Cayman Islands. This rift in the Caribbean seafloor plunges to a depth of more than 5,000 metres below sea level. It contains the world's deepest chain of undersea volcanoes, which have yet to be explored. The researchers are planning two expeditions over the next three years using the UK's newest research ship, RRS James Cook. From the ship, the team will send the UK's remotely-operated vehicle Isis and a new British robot submarine called Autosub6000 into the abyss. The team will look for new geological features and new species of marine life in the rift on the seafloor. Geologist Dr Bramley Murton will use a whale-friendly sonar system to map the undersea volcanoes in unprecedented detail to understand their formation. At the same time, oceanographer Dr Kate Stansfield will study the deep ocean currents in the Cayman Trough for the first time and geochemist Dr Doug Connelly will hunt for volcanic vents on the ocean floor. These volcanic vents are home to exotic deep-sea creatures that will be studied by marine biologists Dr Jon Copley and Professor Paul Tyler. “The Cayman Trough may be a 'lost world' that will give us the missing piece in a global puzzle of deep-sea life,” says Dr Copley. 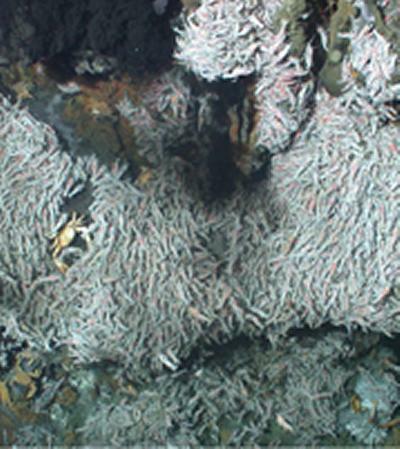 Volcanic vents in the Atlantic are home to swarms of blind shrimp and beds of unusual mussels, while similar deep-sea vents in the eastern Pacific are inhabited by bizarre metre-long tubeworms. The researchers hope to find out whether creatures living in the Cayman Trough are related to those in the Pacific or the Atlantic – or completely different to both. Before North and South America joined three million years ago, there was a deep water passage from the Pacific to the Atlantic. This means that the undersea volcanoes of the Cayman Trough could harbour a 'missing link' between deep-sea life in the two oceans. Finding out just what lives in the rift will help scientists understand patterns of marine life around the world. Working at depths of more than five kilometres will take the UK's deep-diving vehicles close to their limits. Isis is the UK’s deepest diving remotely-operated vehicle (ROV) reaching depths of 6,500 metres. The team will control Isis from their research ship to film the ocean floor and collect samples with its robotic arms. Autosub6000, a new undersea vehicle built in Southampton, can dive to 6,000 metres deep. Autosub6000 is an autonomous underwater vehicle (AUV) – a robot submarine that can carry out missions on its own, without being remote-controlled. The team will launch Autosub6000 from their ship to survey the area and hunt for volcanic vents on the ocean floor. The public will be able to follow the progress of the expeditions through web pages updated from the ship. The team will also invite a school teacher to join them and share the scientific adventure with classrooms around the world. Images are available from the National Oceanography Centre, Southampton Press Office, please call 023 8059 6100. Funding for the research has come from the UK Natural Environment Research Council. Regarding ‘new cancer treatments’ from deep-sea creatures, the biggest success story is discodermalide, a compound from a deep-sea sponge undergoing clinical trials as a treatment for pancreatic cancer. It was discovered by researchers at the Harbor Branch Oceanographic Institute at Florida Atlantic University. The National Oceanography Centre, Southampton is a collaboration between the University of Southampton and the Natural Environment Research Council. It is one of the world’s leading institutions devoted to research, teaching and technology development in ocean and earth science.